This is a bean that came to me from the Heritage Seed library this year. All the beans had a slow start but this one has really picked itself up and gone for it in the last couple of weeks. Just six plants are covering that whole huge (3m high) teepee and are throwing out side shoots which threaten to take over the supports of the neighbouring plants. 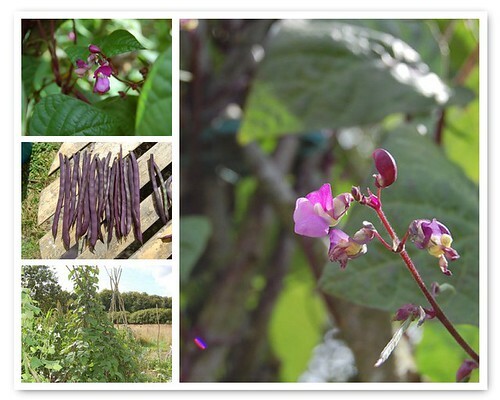 The flowers and foliage are pretty and the set is good; lovely smooth flat purple pods which are stringless at this stage and good to eat. The seed is brown and flat, not large so probably of little use as a dried bean if you have alternatives although they could certainly be eaten if times were hard. ***Update*** The pods did get quite hard and stringy as they aged, perhaps due to the very dry conditions but the mature shelling beans were brilliant. If all goes to plan I'll be offering seeds of this variety in this year's seed swap. It's not the bean I've loved and lost, but it's a valid contender for the vacated position.